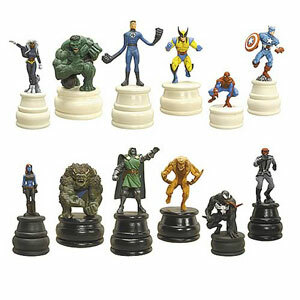 Description Of Item: Your favorite Marvel heroes and villains leap off the comics page and ontot he chess board to engage in the ultimate battle of wits. Will Mr. Fantastic's team of champions prevail, or will Doctor Doom and his legion of evil-doers rule the world? Only you can decide! Each one of these highly detailed collectibles looks as good displayed on your comics shelf as it does in action.